The Huns probably came from western China, where they were known as the Xiong-nu. They were part of the group of Turkic people (some of whom later became the Ottomans) who gradually took over most of Asia and eastern Europe during the Middle Ages. The Huns may have lived in northern China during the Han Dynasty (200-1 BC). Maybe they decided to leave China and look for a better place to live. They divided into two groups, a small group and a big group. The small group went south, towards India. But the main group went north-west to Siberia. These Xiongnu, or Huns , gradually crossed Russia. 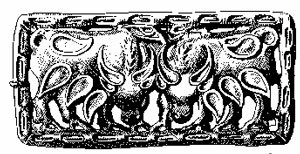 Like the Persians and the Parthians before them, they may have been driven to move on by bad weather in Siberia, which left them without enough grass for their cattle to eat. By 350 AD the Huns were already crossing the steppes toward Europe, pushing the Scythians before them. Various Germanic groups, like the Visigoths and the Ostrogoths, were in turn pushed by the Scythians, and tried to get into the Roman Empire where they might find safety. By 378 AD, for example, the Visigoths were desperate enough to fight and win the battle of Adrianople, which moved them into the Roman Empire. By the early 400s AD, the Huns had learned something about Roman ways, and had a very strong king named Attila. Sometimes the Romans hired the Huns to fight for them, as part of the Roman army. In the 420s and 430s, the Huns helped the Romans to fight the Visigoths. Some Roman men, like the future general Aetius (ah-AY-shuss), grew up with the Huns as part of exchanges so the two groups could get to know each other better. 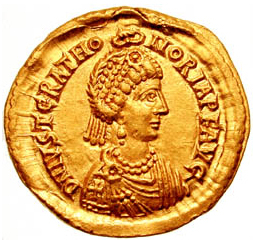 A Roman princess, Honoria, asked Attila to invade the Roman Empire about 450 AD to help her get power. But when Attila did invade, his old friend Aetius changed sides and got the Visigoths to fight the Huns in a big battle in 451 AD, keeping Aetius in power and Honoria out of power. Soon afterwards Attila died, and his three sons split his empire between them. The Huns never again became a strong force, and eventually their great-grandchildren mixed into the Germans and the Slavs. The Huns’ relatives, the Turks and Mongols, however, later succeeded in taking over most of Asia as the Ottoman Empire and the Mongol Empire. Cite this page: Carr, K.E. Huns – Central Asian history. Quatr.us Study Guides, August 2, 2017. Web. April 20, 2019.